Meanwhile, since 1967, over 800,000 Palestinian olive trees have been destroyed by the state of Israel. In addition, tens of thousands of fruit trees, fields, wells and gardens have also been destroyed to make room for Jewish settlement. Having just received this year’s report from Palestinian farmer Daoud Nasser who’s family suffered the Israeli Defense Force’s destruction of 1500 fruit bearing trees last year, I feel deeply disconnected to JNF’s rendering of its mission and its version of history. The narrative on the JNF website resembles the United States’ narrative related to the historic site known as Colonial Williamsburg: an example of national distortions and lies that hide brutal histories. Williamsburg was literally segregated throughout much of its history. And, neither the genocidal histories of the massacre of Indigenous peoples, nor enslavement of Africans or their contributions to Colonial societies were anywhere evident. Just as African American and Indigenous presence and contributions are erased in white America’s Disneyland like portrayals of the past at so-called historic sites, so, too are Palestinians completely erased from Israel’s historic narrative, as are Bedouins, and Mizrachi and African Jews. The terrible dislocations, massacres and massive destruction of Palestinian and pre-1948 material culture and land has been swallowed up and regurgitated in ways that completely distort what actually happened, and is still happening. Jews on free trips to Israel, whether with birthright, or rabbinic school, or the JNF, will feel good about planting the obligatory tree, while pretending that Israel was a barren land before Jews got there and made the desert bloom. They will be given to recite the biblical verse, “It is against Jewish halachic law to uproot fruit bearing trees”, give feel good talks about green Judaism, while completely ignoring a reality that contradicts these claims: the ongoing destruction of Palestinian land, trees, fields, houses, wells, vineyards, and cultural institutions accompanied by Israeli killing fields in Gaza, the West Bank and other areas of Israel. That is the reality which the JNF wants to bury in the ground. While the JNF boasts about its forests in order to perpetuate the myth that Israel is a noble steward of a harsh environment (“makes the desert bloom”, etc..), in reality the state of Israel uses trees as a weapon of colonization to erase the memory of Palestinians from the landscape. On that backdrop, tens of thousands of Palestinian farmers will face the threat of Israel’s Occupation machine whose ultimate goal is to drive Palestinians from their land. 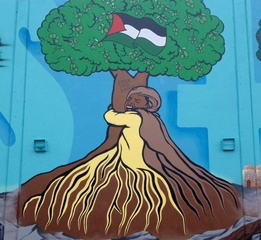 This is the Tu’B’Shevat that we must celebrate: reparations, restoration and celebration of Palestinians on their land.